The Pentagon's mad-science branch DARPA has two new projects under way with the best acronyms ever. Seriously. If you've ever played the Metal Gear Solid games, you know that superscience organization DARPA helped develop much of the series' technology. Well, DARPA (Defense Advanced Research Projects Agency) is an actual branch of the U.S. military, and while it doesn't actually make walking bipedal nuclear-capable tanks (we think ...), it is well-known for being up to its neck in some crazy stuff. It should come as little surprise, then, that two of DARPA's newest projects are Batman and Robin. No, seriously - those are the acronyms of a pair of projects aimed at helping the agency understand the fundamental building blocks of life, the universe, and everything. BaTMAN, or "Biochronicity and Temporal Mechanisms Arising in Nature," seeks to enlighten us further on the "the spatio-temporal universe" with the end goal "to transform biology from a descriptive to a predictive field of science." 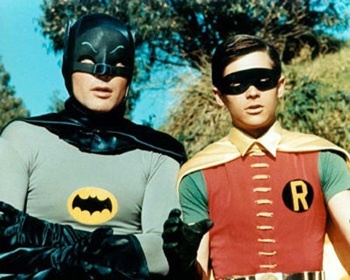 But naturally, BaTMAN needs a sidekick - which is why DARPA has also laid the ground work for RoBIN, or "Robustness of Biologically-Inspired Networks." RoBIN aims to apply "biological design principles" such as collective behavior and complex, biological networks to human interaction - to create a huge, "dynamic biologically-inspired network of scientists and other experts for crisis response." So, why name the two projects after Gotham City's Dynamic Duo? Because it sounds cool, essentially - remember, DARPA is the same group that gave us projects with acronyms like RESURRECT, NIRVANA and DUDE. So there's probably some guy on the payroll whose job it is to come up with nifty-sounding acronyms. And despite these new superhero acronyms, this man is obviously a supervillain. Anyone who comes up with projects named RESURRECT and NIRVANA has to be evil.